This is the Brazilian paperback edition of The Fallen Man, printed in Portuguese. This edition was published in 2000 by by Editora Rocco LTDA in Rio de Janeiro, Brazil. The text was translated into Portuguese by Léa Viveiros de Castro. 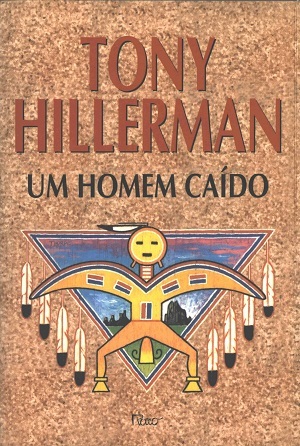 The cover features a reproduction of the illustration from the HarperCollins first edition dust Jacket, designed by Peter Thorpe, who has designed and illustrated over 40 Hillerman editions and whose work has become the iconic imagery associated with Hillerman's novels. The cover features a pictorial representation of a Navajo Yei figure in front of an upside down triangle with feathers hanging from the sides. Inside the triangle are some sandstone formations on one side of the Yei figure and Ship Rock mountain on the other side. Format: Paperback, 21 x 13.8 cm.